Ice plant is the common name used for a large family of succulents. Often used as a groundcover in arid or coastal environments, these trailing plants are decorated with colorful daisy-like blossoms all summer long. Most species of ice plant originate in South Africa where they commonly grow on rocky coastal bluffs, an environment with scant rainfall, little to no soil, intense winds, and salt spray. The resilient, drought-tolerant nature of this plant has made it a popular choice in the arid regions of the western United States and in coastal areas throughout the country. It is possible to grow them in other regions as long as the growing medium provides sufficient drainage. 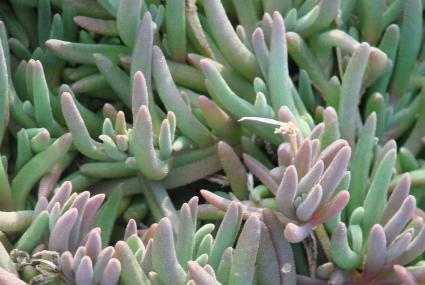 Ice plants have elongated, finger-like leaves that look plump and lush, even in blistering hot weather. The foliage is often coated with a film composed of a crystal-like structure that has a whitish, reflective appearance and is the source for the name ice plant. The flowers closely resemble daisies or asters and come in almost every color imaginable from pure white to purple and magenta. The plants creep along the ground, usually growing no more than six to eight inches tall. In cold weather, the foliage becomes colorful in cool weather in shades of purple, blue, orange or red, depending on the plant, making it an attractive specimen in all four seasons. One type of ice plant, called 'Hottentot fig' (Carpobrotus edulis) is a common sight along the freeways of California, spawning its nickname "Highway ice plant." Thousands of acres were planted along right-of-ways throughout the state in the past, though it has since spread on its own to colonize huge swaths of land, especially on coastal bluffs. Though this species is still sometimes available in nurseries, it is unadvisable to plant it in the western U.S. because of its invasive tendencies. In other areas of the country it is not considered invasive. Fortunately, no other type of ice plant is considered invasive. Good drainage is the most important growing requirement for ice plants, as they do not like soggy roots. A little water through their first summer is helpful for getting them established, but afterwards irrigation will only hamper their growth. Besides being well-drained, the soil should be low in nutrients - in other words, no need to add compost or fertilizers. 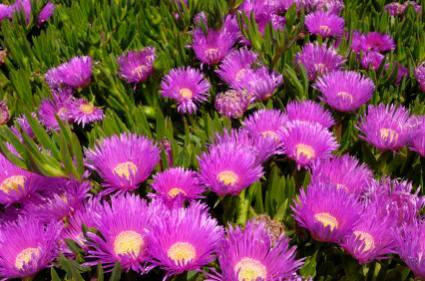 Ice plants will grow in pure sand or gravel, which can be mixed into garden soil to create a more ideal growing medium. 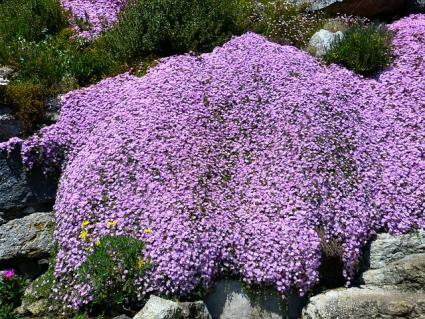 Ice plant thrives in full sun, though it will grow in partial shade as well. Ice plant is commonly available at nurseries in groundcover flats, which are planted as small plugs about eight to 10 inches apart. It is also easy to grow from seed, which should be sown indoors in early spring. One of the wonderful things about ice plant is that it has virtually no maintenance requirements and is unaffected by pests and disease! Ice plant will grow from three to four feet in a season and quickly cover the space allotted for it. The only potential maintenance issue would be removing it if it grows into areas where it is not desired. 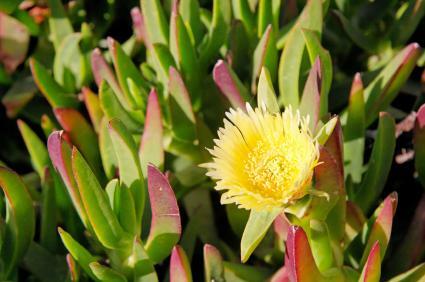 Incorporate ice plant as a groundcover in rock gardens or plantings of succulents and cacti. Because of its trailing growth habit, it is particularly effective when planted where it can spill over small boulders or a retaining wall. It can also be used in potted arrangements on decks and patios, though it's best to use a specialized cactus mix, rather than regular, potting soil. Ice plant is one of the best species for erosion control on dry sunny hillsides, where it will quickly fill into form a continual mass of foliage and a mat of roots that anchors the soil. 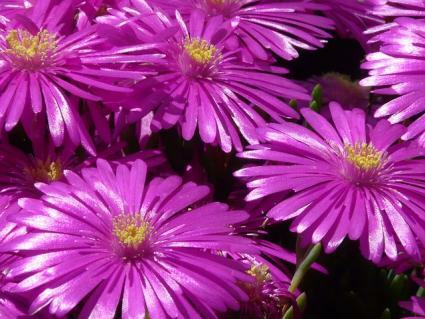 Ice plant is also very fire resistant, and is a wise choice as a groundcover in extremely arid, fire-prone regions. A number of different types of ice plant are available in nurseries with variation in size, leaf structure, and flower color. 'Cooper' grows three to four inches tall and has hot pink flowers. 'Hardy yellow' grows just two inches tall and has bright yellow blossoms. 'Starburst' has pink flowers with white centers. 'Sutherland's' has flattened leaves and purplish-pink flowers. The phrase bomb-proof comes to mind when trying to characterize ice plant. It is a highly specialized species, but if you need something that requires no water, virtually no soil and tolerate extreme winds, there are few other options that compare.